Now it's time to compare both the reference model that we have learned till now. Let's start by addressing the similarities that both of these models have. Following are some similarities between OSI Reference Model and TCP/IP Reference Model. Following are some major differences between OSI Reference Model and TCP/IP Reference Model, with diagrammatic comparison below. 1. OSI is a generic, protocol independent standard, acting as a communication gateway between the network and end user. 1. TCP/IP model is based on standard protocols around which the Internet has developed. It is a communication protocol, which allows connection of hosts over a network. 2. In OSI model the transport layer guarantees the delivery of packets. 2. In TCP/IP model the transport layer does not guarantees delivery of packets. Still the TCP/IP model is more reliable. 3. Follows vertical approach. 3. Follows horizontal approach. 4. OSI model has a separate Presentation layer and Session layer. 4. TCP/IP does not have a separate Presentation layer or Session layer. 5. Transport Layer is Connection Oriented. 5. Transport Layer is both Connection Oriented and Connection less. 6. Network Layer is both Connection Oriented and Connection less. 6. Network Layer is Connection less. 7. OSI is a reference model around which the networks are built. Generally it is used as a guidance tool. 7. TCP/IP model is, in a way implementation of the OSI model. 8. 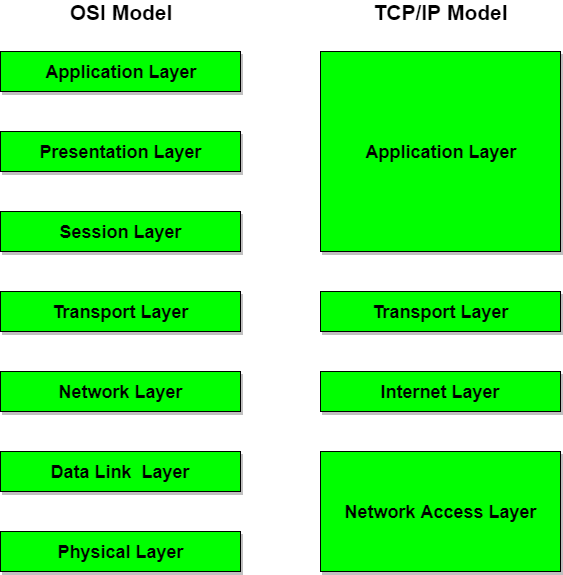 Network layer of OSI model provides both connection oriented and connectionless service. 8. The Network layer in TCP/IP model provides connectionless service. 10. Protocols are hidden in OSI model and are easily replaced as the technology changes. 10. In TCP/IP replacing protocol is not easy. 11. OSI model defines services, interfaces and protocols very clearly and makes clear distinction between them. It is protocol independent. 11. In TCP/IP, services, interfaces and protocols are not clearly separated. It is also protocol dependent.